The Interim, or 'Jan Term,' is the middle of LaGrange College's academic calendar, between fall and spring semesters. Interim courses are designed to encourage students to explore course content outside of their majors through personal, hands-on experience. Jan Term classes include on-campus projects, independent research, internships and study-travel experiences. Capture a glimpse of the fun and challenge of Jan Term by taking a look at recent classes below. This course focuses on the politics, economics, culture and environment of Africa through the exotic country of Tanzania. Students will fly in past the legendary Kilimanjaro to spend time in Arusha, a city where the Rwanda massacres were prosecuted. We’ll view that location, visit the African Court on Human and Peoples’ Rights which continues to wage the fight for justice in countries today, and see the East African Community HQ, where economic development is the mission. We’ll also go out to Shenga Shenga market, where beads, glass, pottery, and other goods are made by handicapped adults and children. Then we’ll travel to the desert outpost in Isoitok, engage in a wild Tarangire game drive, and drive through the amazing Ngorongoro Crater, where elephants, lions, hippos, rhinos, ostriches, zebras, cape buffalo and other animals dwell in their natural habitat, ending the trip at the Karatu Country Lodge. Majors from all disciplines will benefit from this game-changing ten day trip. 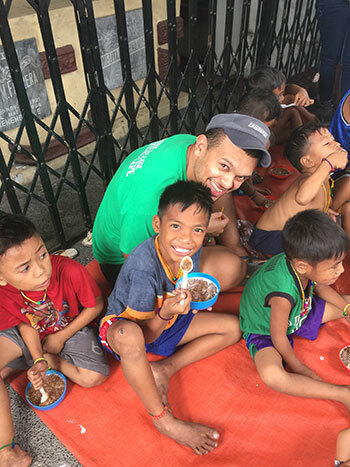 This travel course provides an opportunity to experience service learning in the metro area of Manila, Philippines and tropical ecology in a remote area of the Philippines. The Philippines includes 7000 islands and 80 local languages. The Philippines ecology also is diverse and beautiful, including volcanoes, rain forests, beaches, and some of the world’s most diverse coral reefs. Since English is the language of instruction in schools, communication with locals is easy. Filipino culture has an Asian foundation, but has been modified by 3 centuries of Spanish and American colonial rule. Students will find Filipinos to be exceptionally warm and hospitable people and have the opportunity to form lasting friendships. The objective of this travel away course is to gain an understanding of Thai culture through excursions in Bangkok, Chiang Mai, and the surrounding mountain regions of northern Thailand. Students will have an opportunity to experience the culture of Thailand through a program provided by Chiang Mai University and local expert guides. Experiences include working with hill tribe ethnic groups and other populations. Through visits to selected venues students will learn about the economic, religious and social practices of Thailand. The Yucatan peninsula is a safe, welcoming, Mexican province where the Mayan people historically built great cities and continue to live today in an environment filled with stunning archaeology, an impressive diversity of birds and wildlife, and a friendly, traditional culture. This course will explore the people, culture, food, flora, and fauna of the Yucatan, focusing on the tropical coastline known as the Mayan Riviera. This course will take a comparative look at schools and communities from the Capital to the Coast of Costa Rica and Georgia. Students will spend the first week of the course investigating, visiting, and participating with schools and community outreach programs for children and families in Atlanta and coastal areas in Georgia. After exploring local issues and needs, students will spend 10 days in Costa Rica visiting schools and participating in community outreach programs in the capital city of San Jose and the coastal town of Manuel Antonio. Discover how schools and communities interact in local and international locations. Other activities will include visiting the city market in Quepos, exploring the sights around San Jose such as the Poas Volcano, Doka Coffee Estate and La Paz Waterfall, touring the beautiful Manuel Antonio National Park, cruising on a catamaran around the National Park, and spending afternoons and evenings interacting with locals in a variety of contexts. Take a journey through some of the most important centers of western music history including Prague, Vienna, Venice, and Milan. In Prague, visit the Estates Theater where the premiers of some of Mozart’s most famous operas and symphonies took place. In Vienna, see where Mozart and Haydn lived and worked including the famous Esterhazy Palace in Eisenstadt. In Venice, see the famous St. Mark’s Basilica where many famous composers worked and where polychoral music was invented. Visits to the La Pieta Church (Vivaldi) and the famous opera house “La Fenice” are also included. The trip culminates in Milan with visits to La Scala opera house and to see da Vinci’s The Last Supper. This course includes visits to three of Italy’s most significant cities: Naples, Rome and Florence. In Naples, students will visit the Archeological Museum, with many artefacts from the excavations at Pompeii and Herculaneum, as well as the Museum at Capodimonte. They will also tour underground Naples, together with Pompeii and Paestum, the site of several Greek temples. In Rome, students will visit the Pantheon, the forum, the Colosseum, Saint Peter’s Basilica, the Vatican Museums, the Sistine Chapel, and several recently opened archeological sites, such as the Crypta Balbi. In Florence, they will visit the new museum of the Duomo, the Uffizi, the Accademia, which houses Michelangelo’s David, the Baptistery, and Santa Maria del Fiore, where they will climb up to the cupola of Brunelleschi’s celebrated dome. Some free time will allow for private explorations. Students will travel to Europe and discover the cultures of two major cities: Paris, France (the romantic city of lights with the Louvre, the Eiffel Tower, the Champs-Elysees, and internationally renowned foods: wine, cheese, chocolate and much more) and Barcelona, Spain (a lively and vibrant city with superb restaurants, sidewalk cafes, art and music). Students will be instructed and enlightened by a team of expert professors who will accompany the group every step of the way. In this course, students will learn about the culture of France and Spain and visit many popular tourist attractions such as the Eiffel Tower. To prepare for traveling, students will be instructed in both survival French and survival Spanish. In addition, because these two countries are famous for their cuisines, students will be introduced to the basic chemistry behind the development of internationally famous wines, cheeses, and other popular dishes. We will of course sample many of these delicacies during our travels, and after a cooking class in which we will assist in the preparation of a meal. Students will also learn about the multi-million dollar perfume industry and how to make their own signature aromas. Students will be working in poor communities located on the outskirts of Quito. Teams will work with local pastors and churches on projects to benefit children and the elderly in these communities. Construction will be a major component of the team. Students will help build facilities for housing and feeding the elderly poor and/or for after school programs for Compassion International children. Each construction team will also have Vacation Bible School component branching out into marginalized areas of Quito teaching very poor children about the love of Jesus. Students will also work with youth providing education, mentoring, and sports play. The cocoa/chocolate and cut flower industries will be studied and students will visit a rose plantation, cocoa producer, indigenous markets, and historic and natural sites. The course also includes the activities of zip-lining the cloud forest and riding a cable car to the top of the highest mountain in Quito. The geographic isolation of the Hawaiian Islands contributes to its unique ecology, culture and social issues. This course will examine the diverse habitats and unique geologic features found on Oahu and the Big Island as well as the social and economic factors affecting native Hawaiians. Several snorkeling events, day hikes, and an optional experience in a shark cage will provide the opportunity to explore marine ecosystems, extinct volcanoes, and rain and cloud forests. Students will experience the history and culture of the Hawaiian Islands with trips to the last palace of the monarchy and a luau. Finally, our participation in two service projects including rainforest restoration and the serving the homeless population provide the opportunity to witness and effect economic and social issues in Hawaii. This is a service-learning course that provides students the opportunity to be fully immersed in the Ugandan culture. Students will be introduced to public health issues from a global perspective, although the focus will be on Uganda. Working alongside the Ugandan people, students will have the opportunity to participate in medical clinics where they will provide education about health promotion and disease prevention. Walk in the footsteps of Socrates, Plato and Aristotle in Athens to learn how their ideas on education are still relevant today. Then travel to Peloponnese to learn about the first Olympic Games and grasp the complexities of ancient Greek societies through excursions to historical archaeological sites. 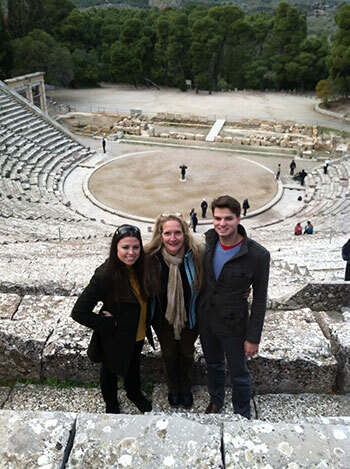 Before traveling to Greece, students are required to complete online assignments that include viewing video lectures and writing responses to posted readings. Course goals are evaluated with structured written responses to selected readings and pre-recorded audio and video lectures. Although no major revisions are anticipated in the courses described in this brochure, LaGrange College reserves the right to make whatever changes may be necessary in the status, costs, requirements, or other details of its Interim courses. Any course may be canceled for adequate reason, such as lack of sufficient enrollment.